Because whenever Bigfoot makes the news, it's news you can use. Multiple British tabloids are reporting on the recent findings of one Adam Bird, who claims to have captured evidence of a mysterious beast lumbering through the Lincolnshire woods. Image by Pyro Helfier via Deviant Art. After hearing of previous Bigfoot sightings at the nature reserve, Adam, from Nottingham, ventured into the woodland in search of clues. He followed some strange noises and suspiciously large footprints in the woods before capturing what he believes is the mysterious beast on camera. 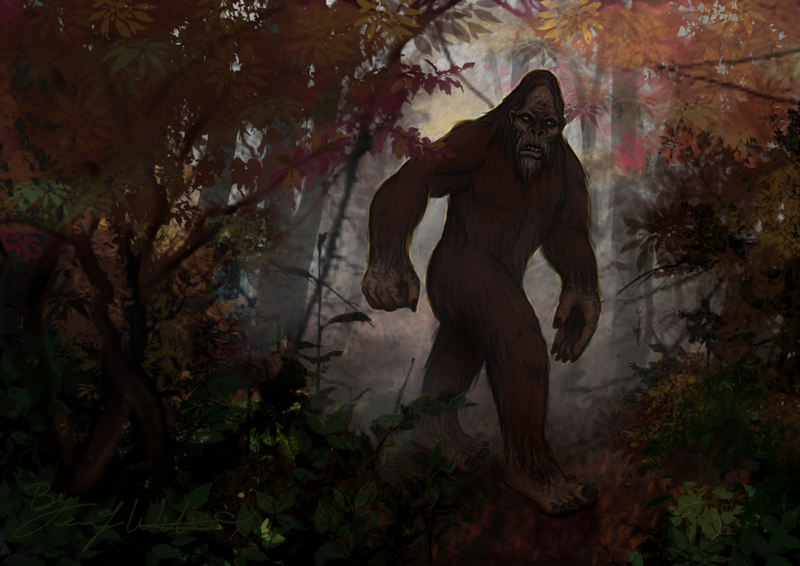 Adam, co-founder of the British Bigfoot Research organization, believes the shadowy figure could be the most convincing evidence that it's living in Britain yet. He said: "My investigators and I were tipped off that this small patch of woodland in Friskney could be a hotspot for Bigfoot beasts. There is at least one reported sighting here, so we decided to check it out." "We stayed there for a few hours that day and felt watched and followed the whole time. I took various photographs throughout the investigation and when I checked back through them I spotted the creepy picture. It looks like a shadowy figure stood within the trees staring at us from afar." Although he did not spot the creature at the time he took the photograph, Adam, who has been investigating bigfoot sightings in the UK for more than two years, is convinced of the creature's existence. It was on holiday in Florida, aged 15, when he claims to have first encountered the Sasquatch phenomenon. He spotted a large orangutan-like creature with reddish-brown hair crouching in the bushes and has been obsessed with the legend ever since. Judge for yourself in Bird's most recent footage, posted below.